The Pars clock up another vital win and move up into fourth place in the league after this 2-0 win over Livingston. Once again, this win will have done Jim McIntyre`s ambitions of being the new manager no harm at all. Jim Hamilton opens the scoring! With a 5 minute delay to kick off to let the large away support in to the stadium there then followed a respectful round of applause in memory of Phil O`Donnell the Motherwell skipper who passed away last weekend. Some things are more important than football. The Pars lined up with newly signed keeper Paul Gallacher in goals and with the now familiar back four of Woods, Harris, Thomson and Murphy. The midfield quartet was McGlinchey, Simmons, Crawford and Scott Morrison. Burchill and Hamilton were the strike force. Jim Hamilton celebrates with Mark Burchill and Scott Morrison. The first half chance of the game fell to Livi with Snodgrass who hit a shot well wide in 2 minutes. A very good move by the Pars with Woods on the right ends with Hamilton shooting but saved by Stewart for a corner. McCaffrey hit a shot from distance but it was well over the bar. The Pars take the lead in 9 minutes as Burchill is sent down the inside right position and he squares the ball to Hamilton who touches it into the net.0-1. Then quite unbelievably the Pars fans had hardly sat down when they were up on their feet again celebrating the second goal this time scored by Burchill. Mark almost seemed to mishit his shot but the keeper appeared to dive early expecting a full shot and it seemed to trundle over him into the net. 0-2. Livi get a free kick in 17 minutes and the kick almost catches Gallacher off his line but it dips over the bar. The Pars were actually playing some nice football which was good to see. A weak header by Craig in 23 minutes was all that the home side could do to stem the tide. Indeed, Livi made an early change with Tinkler being replaced by Walker in 25 minutes. who died tragically last week. Jamie Harris has been a tower of strength since he took up the centre back position but it was a minor error from him that allowed Makel to get a shot on target in 32 minutes. Probably the home sides best chance in 33 minutes was a free header for Craig when a ball rebounded kindly onto his head 8 yards out but he only just missed the corner flag! Mark Burchill provides the pass for the opening goal. Stephen Simmons was having one of his better games for the Pars and he made a good defensive header in 40 minutes as the home side struggled to pull a goal back before half time. Another feature of the half was good running and closing down by Burchill especially at the keeper who was panicked a couple of times by the wee striker running in on him. Danny Murphy is a tenacious player but he was chopped down from behind in 40 minutes as Livi were clearly getting frustrated. Half time 0-2. Jim Hamilton celebrates with Mark Burchill. The Pars fans were hoping for more of the same in the second half. A low shot by Walker was easily taken by Gallacher. Simmons was fouled in 52 minutes and the free kick was headed wide by Harris. Burchill was almost through in 58 minutes but the keeper saved with Hamilton hitting a long shot wide from the rebound. 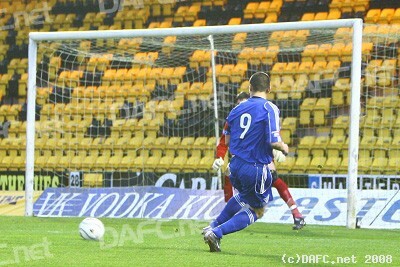 In 61 minutes a Livi shot was deflected off the Pars right hand post going out for a corner. A change for the Pars in 63 minutes as Wilson comes on to replace McGlinchey with the Pars going to 3-5-2 to counter Livi who were doing much the same. The Pars win two corners in quick succession with Wilson heading wide from the second effort. Woods was yellow carded in 68 minutes for a foul. Makes a change from doing it to his own fans. Hamilton headed a good ball back across goal from a corner just missing the top corner in 72 minutes. Immediately at the other end Gallacher was at his very best to stop a shot from 6 yards out putting the ball out for a corner, he earned his money with that save. 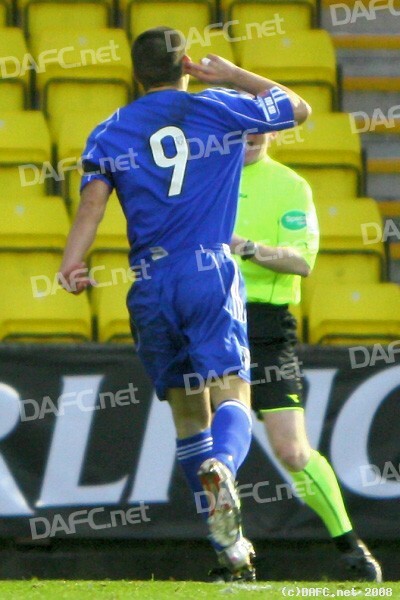 Murphy is now booked as the Pars fans give the referee a chorus of "You don`t know what you`re doing!". It was a good tackle, not a foul. 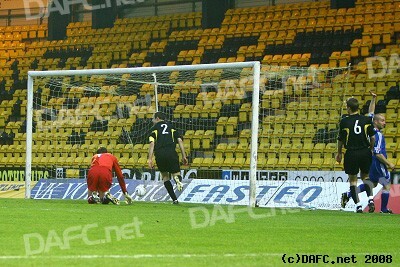 Another great save by Gallacher in 78 minutes with Livi`s Dorrans being booked. McIntyre brought himself on in 79 minutes for Hamilton who got a well earned ovation from the fans.